Very fashionable, Retro and fun to wear Lego Plate Ring. 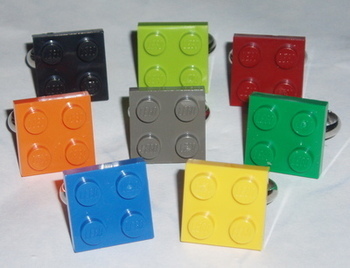 2x2 plate in a selection of colours on a sturdy silver plated adjustable ring base. Available in Child/teenager and Adult size. Just choose the colour you want from black, lime, red, orange, dark grey, green, mid blue and yellow. You can add a Swarovski crystal if you like.